2+ monsters, except Tokens Once per turn, during the Damage Step, when a Spell/Trap Card, or monster effect, is activated (Quick Effect): You can negate the activation. If this card attacks a Defense Position monster, inflict piercing battle damage. During your Main Phase, except the turn this card was Special Summoned: You can Tribute this card, then target 1 Link-2 or lower monster in your GY; Special Summon it, then you can Special Summon 1 Level 4 or lower Dragon monster from your hand. Triple Burst Dragon is a decent Link 3 that will cause some decks more problems than others. Tokens can’t be used, so no Scapegoat shenanigans, but it is easy enough to make. A once per turn negation during the Damage Step of any effect stops flip effects, ATK changes, and Borreload Dragon from stealing another monster of yours. Piercing damage added on to the 2400ATK is a nice feature, not a big deal though. You have to wait a turn for the final effect, which can be a big thing, but since you likely used a Link-2 or lower to help make Triple Burst, you likely won’t want to trade it in straight-away. 1-for-1 at the least, getting back a Link-2 or lower from your grave to the field (in the Main Monster Zone) is a good way of freeing up your Extra Monster Zone and giving you more zones to Special Summon to. For those running Dragon-Type monster, Triple Burst popping itself will also Special Summon a Level 4 or lower Dragon from their hand, offering a Link 2-3 Summon immediately. The cost-free negation each turn is great, piercing damage is good, and popping to free up your Extra Deck Zone to get your Link-2 back that you used for Triple Burst is a great effect as well. Triple Burst Dragon is a Link 3 Dark Dragon-type Link Monsters with 2400 Atk and Top, Left, and Bottom Arrows. 2400 Atk is decent for the number of monsters you need to Link Summon this. You need 2 or more and they cannot be tokens. Dark and Dragon are and will always be very well supported. There are 3 effects which makes sense. The first is that you can negate anything once per turn if it’s during the Damage Step. The second effect is piercing. The final effect is long but it does work with Link Summoning. During your Main Phase of a different turn than the one it was Special Summoned, Triple Burst Dragon can tribute itself to target a Link 2 or lower monster in your grave for Special Summon and then Special Summon a Level 4 or lower Dragon from your Hand. Damage Step negation is rare, and I love that this effect is completely free. Piercing is ok. The last effect is interesting and can become a backup play if everything goes wrong. But since you have to wait a turn to get anything out of the third effect, it might go to waste most of the time. Therefore, Triple Burst Dragon will receive the score it was always meant to receive. No need to max out the Extra Deck for this. I like looking at generic Links and this is another case of a pretty solid generic Link, Triple Burst Dragon. TBD is a Link-3 DARK Dragon with 2400 ATK requiring 2+ monsters that aren’t tokens and arrows pointing Up, Left, and Bottom. 2400 ATK seems to be the acceptable baseline for a Link-3, and the summoning condition is easy to fulfill, even using tokens. DARK and Dragon are huge upsides. The arrows are odd, but they do help with Extra Linking. Once per turn, during the damage step of either player’s turn, when a Spell/Trap Card or monster effect is activated, you can negate that activation. Nice little way to stop stat boosters like Honest or something. Neat effect that has its uses. If this card attacks a DEF Position monster, you inflict piercing. Piercing is a nice bonus to any monster, and 2400 ATK is acceptable to have that effect on. During your Main Phase, except on the turn this was summoned, you can tribute this card to special summon a Link-2 or lower monster from the GY and a Level 4 or lower Dragon from the hand. Nice way to replace this card if he wasn’t doing enough for you, he gives resources to summon a different Link-3, which I can respect. I like Triple Burst Dragon, maybe one day he will have a really good home, but he is pretty solid for right now. Art: 4/5 He shoots from all directions except right, he isn’t a righty sadly. 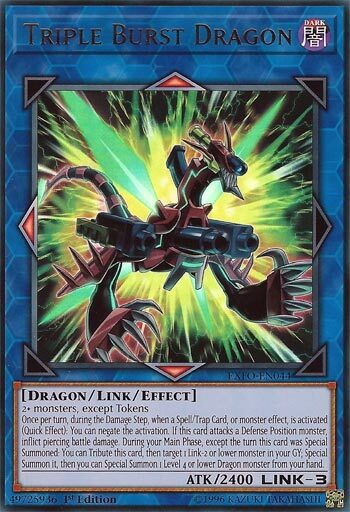 Midweek brings us to Triple Burst Dragon, a Link Monster (who is Link 3, coincidentally featuring Triple in his name?? I think not). Dark and Dragon and great off the bat, and 2400 attack isn’t terrible for a Link 3 investment. Arrows here point directly above and below, and to the immediate left. So, to start, once a turn, as a Quick Effect, you can negate the activation of a Magic/Trap card or Monster effect. Said effect applies only to the Damage Step. TBD also has trample, which is useful on a Monster with an attack of 2400, so that’s a plus in my book. He can also Tribute himself from the Field (save the Turn he’s Special Summoned) to bring a Link 2 or lower Monster from your Graveyard back to the Field. You’re also allowed to Special Summon a Level 4 or lower Dragon from your Hand afterward. So you get to plus off that, and that opens the door for other Summons (Link or otherwise) after as well. This guy obviously works best with Dragons, but he works in others as well, ignoring the Dragon effect at the end.